Coffins come in many shapes and sizes, though, technically, a coffin is a six-sided container or box for burial. A casket is generally understood to have four sides and be rectangular. 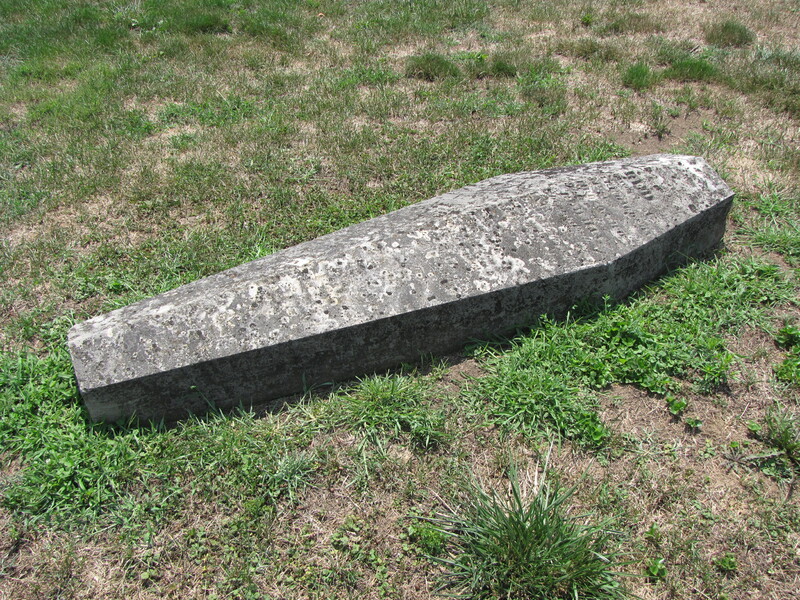 The six-sided coffin tombstone found in the Groveport Cemetery at Groveport, Ohio, pictured above is tapered to widen around the shoulders and then become narrow around the feet. The coffin-shaped tombstone replicates what many 18th and 19th century coffins looked like. This funerary motif represents death and mortality. The gravestone marks the grave of a young wife who died at the delicate age of only 22 years. The woman was remembered in her inscription as a bride and a daughter, as she was most likely not married for any length of time. The epitaph paints a picture of a beautiful young woman snatched away by the Icy and Withered Hand of Death. The Icy Withering Hand of Death Has Rifled All Thy Fragrant Store. Note: I first saw the gravestone above on the Website: www.graveaddiction.com. Beth Santore, the Webmaster gave me great directions to find the cemetery. I was just in Ohio Monday and snapped some pictures of the gravestone for myself. I highly recommend her Website, especially for those tramping around Ohio graveyards! This entry was posted in Symbolism, Tombs. Bookmark the permalink.